Built-in-wheels make it easy to rearrange your store! Divided cabinets offer unique display opportunities! Locking doors keeps items safe from theft or damages! LED top and side lights spaced over two side lighting tracks to really illuminate displayed merchandise! Click here for a video demonstrating how to receive and uncrate a showcase. Click here for an instructional video on how to install sliding glass doors. These glass cabinets are oversized to display many products at once! 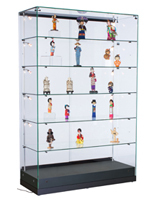 The display cases, glass cabinets are designed for use in museums, retail stores, business lobbies and much more. 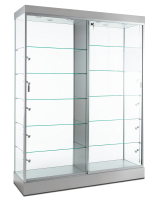 Glass cabinets are ideal for stores or other commercial environments looking to buy a minimum number of cabinets, whether for financial or spatial reasons. 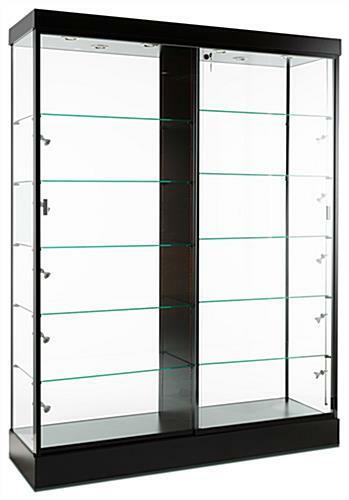 These glass cabinets offer multiple levels to hold your entire product collection. 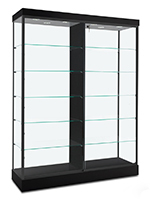 These glass cabinets feature a black base and canopy. 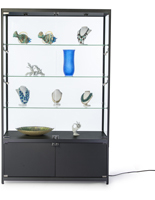 Items such as gold or silver jewelry, glass collectibles, trophies and other fine merchandise look stunning in these glass cabinets with black laminate accents. 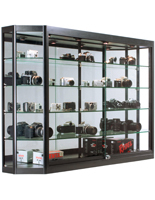 These glass cabinets, also known as display cases, are crafted from tempered glass to offer a safe alternative to traditional, annealed glass. Also included with these cabinets are: wheels for quick and easy rearrangement of your location, ten half-length, adjustable tempered glass shelves (cabinets look great with a staggered shelf design), a glass back for placement in the center of your sales floor or against a wall, and sliding, locking doors so only authorized sales associates have access to merchandise displayed within the cabinets. Perhaps the best selling feature of these cabinets is their extensive lighting system. An electrical cord and switch offers quick and easy access to six LED top lights and ten LED sidelights. 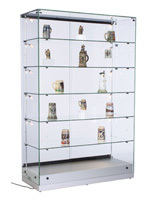 These sidelights help to illuminate products at each level in such a large glass display case. Track lighting is pre-mounted within the case. Lights are spaced evenly along two tracks. 58.0" x 79.0" x 19.3"